We have a special treat for you today. My friend Erin teaches 7th grade at the Maywood Avenue School in Maywood, NJ. We organized a writing contest with her students. Each one had to write a food-related post on their blogs that they maintain for class. Erin sent us the submissions, and we chose three winners. 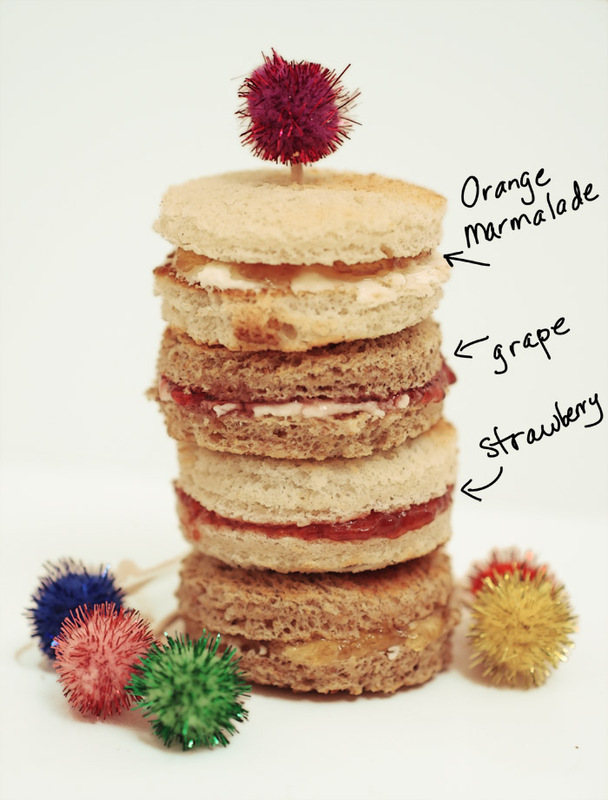 How to make a jelly and cream cheese sandwich? Now I bet you’re wondering if that’s even a real, edible combination. Don’t worry, it’s tasty! I’ve eaten these sandwiches my whole life. I have no idea how I discovered this combo. My mom showed it to me. It’s really good for breakfast. Now, here’s what you need to make this random sandwich. Now once you have all those things, you’re ready to make an awesome snack! Step One: Take two pieces of bread and toast them. But make sure you don’t make the bread too crunchy, unless you like crunchy bread. Step Two: Carefully take out the two pieces of bread out of the toaster and put it on the plate. Also take out the cream cheese and jelly. 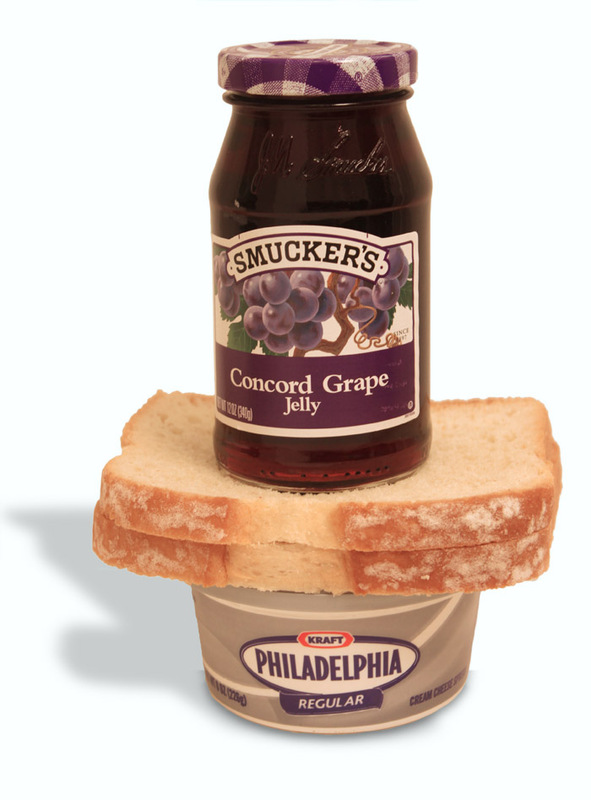 Step Three: Get the two knives and spread jelly on one piece of bread, and cream cheese on the other. Don’t put too much jelly or cream cheese. 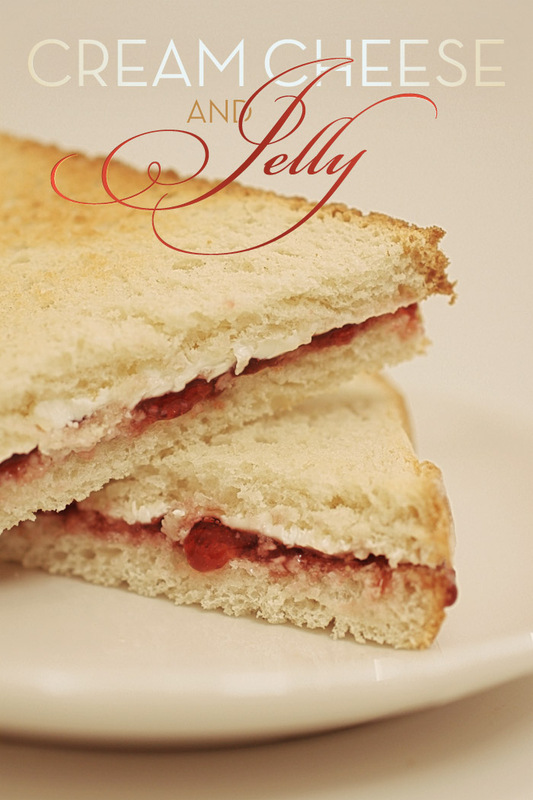 When you put too much jelly, the sandwich gets soggy. Then when you put too much cream cheese, you won’t be able to taste the jelly. So make sure they’re equal. Step Four: Get the two pieces of bread and put it together. You can do this any way you want. You can smash it on, gently place it on, or just put them together like a normal person would. CONGRATULATIONS! 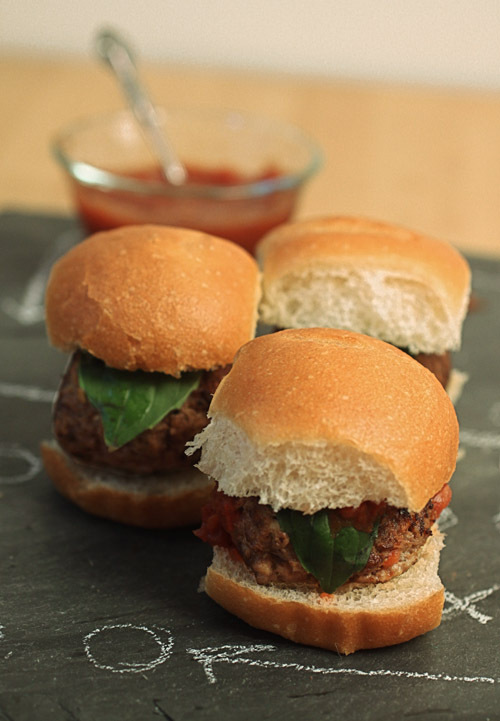 YOU HAVE CREATED TOMORROW’S LUNCH, TONIGHT’S SNACK, OR THIS MORNING’S BREAKFAST! Sadly, I don’t have a finishing product picture. That’s because it’s your job to see it yourself! 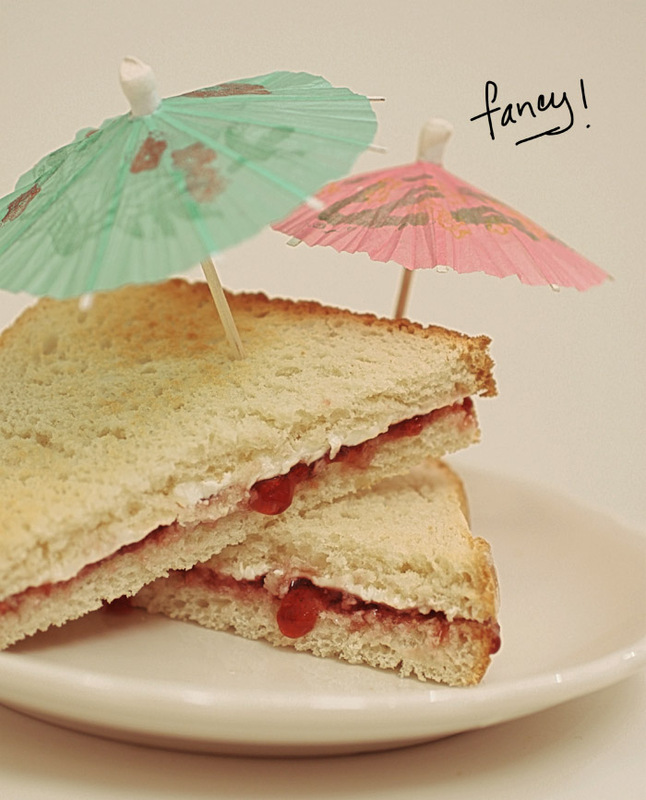 Feel free to make this sandwich, and stab a little, cute umbrella into it. Mini umbrellas are cool! *We added a finished photo for Jessica, complete with mini umbrellas…. I hope you enjoyed this step-by-step guide! I think this isn’t difficult to make, so you should really try it! You can read Jessica’s original post here. Crazy news, everyone: John and I are going to be at an event! 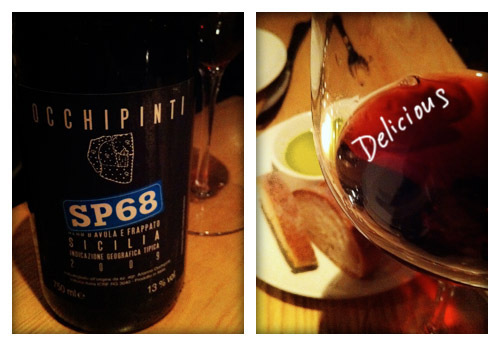 67 Wine and Spirits is hosting a free Sicilian wine tasting at their shop. Robert Camuto, author of Palmento: A Sicilian Wine Odyssey will be discussing his book, and there will be a sampling of Sicilian wines from a four different producers. In addition, John and I will be there offering our homemade ricotta cheese as a complement to the wine. It’s going to be fun, and you should come check it out. Here are the full details and the link to the formal, engraved invitation is here. When: Saturday, March 19, 4:30 pm – 7:30 pm. 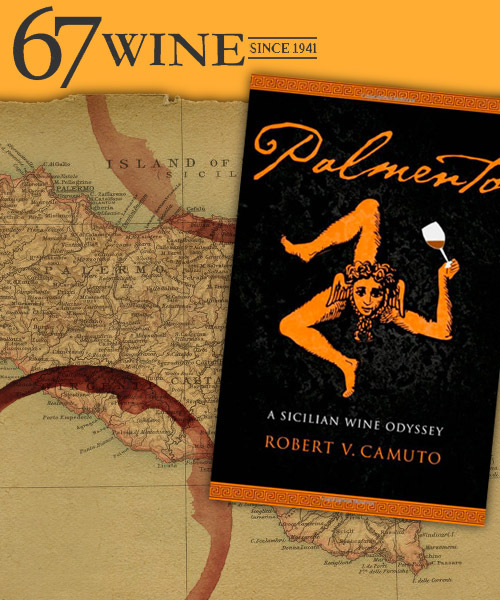 Join Award-winning author Robert V. Camuto for a discussion of his most recent book, Palmento: A Sicilian Wine Odyssey, as well as a tasting of Sicilian wines. Palmento is the story of author Camuto’s year-long quest to explore Sicily’s emerging wine scene. Amid the wild landscapes, lavish markets, and astonishing natural warmth of its people, Camuto portrays Sicily at a shining moment in history. He takes readers into the anti-Mafia movement growing in the former mob vineyards around infamous Corleone; tells the stories of some of the island’s most prominent landowning families; and introduces us to film and music celebrities and other foreigners drawn to Sicily’s vineyards. Above all, he introduces readers to the wonderful culture and flavor of Sicilian wine. Camuto will be at 67 Wine & Spirits Shop from 4:30 p.m. to 7:30 p.m. for a book discussion and tasting of Sicilian wines, including several from winemakers profiled in Palmento. 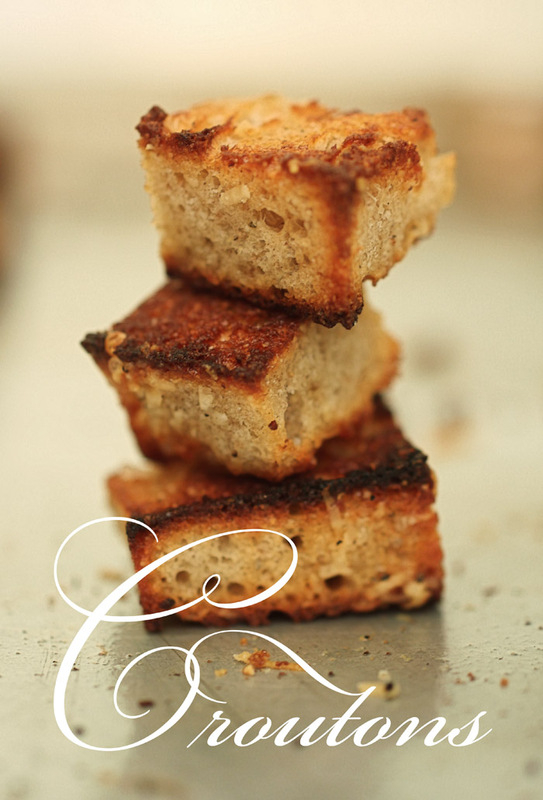 Additionally, Sicilian treats including artisan focaccia and handmade ricotta will be served. The event is free and open to the public. We’ll also have Arianna Occhipinti’s two olive oils – Gheta and Pantarei – on hand to taste, as well as handmade ricotta from Elana Iaciofano of John and Elana Talk About Food. Ben Wood, one of our buyers and resident bread maker will offer for the noshing his fabled focaccia. ** We would like to note that we are not responsible for any disappointment you may feel upon meeting us in person. However, John would like to add this his hair is WAY more impressive in real life. I cheated. It wasn’t a planned thing, it just kind of…happened. You know? I’m talking about bread. What did you think I was talking about? Based on the unfortunate results of previous efforts, I’d become a little downtrodden. I wasn’t getting what I wanted. I had such high expectations every time – “This one will be it!” I’d think. But invariably, I was disappointed. I’m still talking about bread. 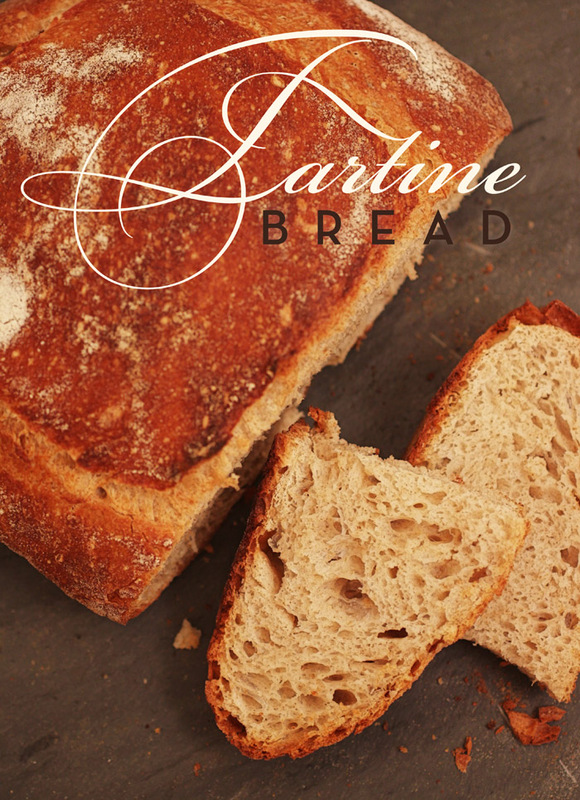 You’ll recall that my first attempt at the Tartine bread making method had me putting the dough in my bathroom to rise in the hopes that the warmer temperature would hasten the process. No luck. My bathroom bread was flat as a Red Velvet Pancake. So I did. Just a little bit, not a whole package. 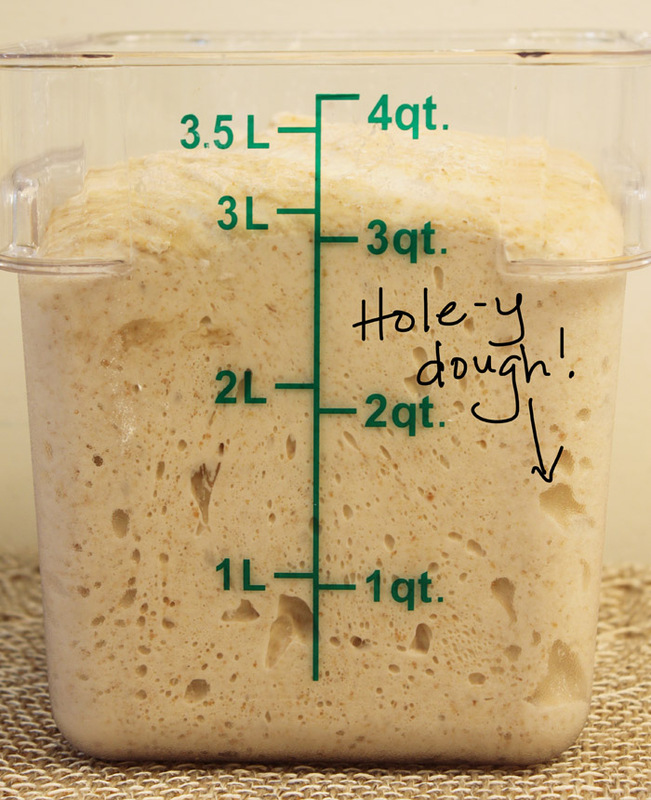 And then I mixed up my dough and left it alone for 3 hours for the bulk fermentation. When I say I left it alone, I literally left my apartment. I couldn’t stay there and wait for nothing to happen. So I went out and returned about 4 hours later. To my surprise and incredible glee (I let out a squeal which scared the dog), it had risen! I almost didn’t know what to do with myself. 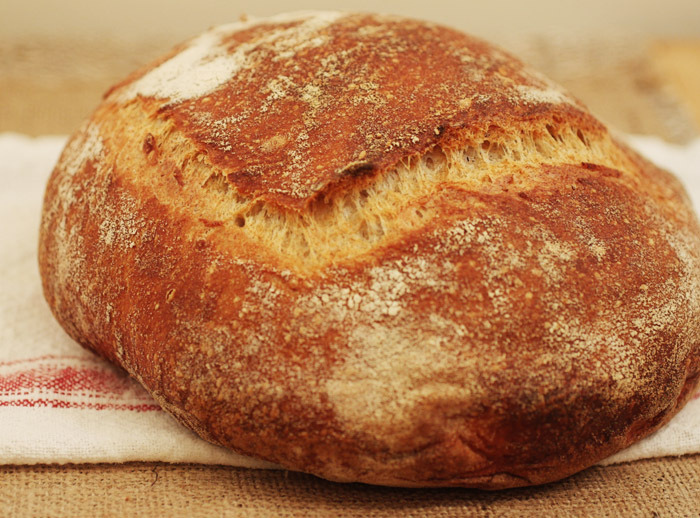 I regrouped, and went through the other steps, resulting in a beautiful, risen, light, fluffy, flavorful, crusty on the outside, squishy on the inside (with nice holes to boot) loaf of bread. I was beside myself with carbohydrate-related joy. My bread even crackled while cooling (something referred to as the Song of the Bread in Tartine). I’m afraid this is only going to encourage me to keep cheating. With bread. Now that I had this amazing puffed-up specimen, I had to decide what I was going to do with most of a loaf of flat-ish bread. So I made Peccorino and Herb Croutons with it! *Optional: salt. Peccorino is a very salty cheese, so don’t over-salt these guys. Only use extra salt if you really feel like you need to. Fire up the broiler of your oven and get out a cookie sheet. Place the cubed bread in the plastic bag and throw everything else in there. Dump the contents of the bag onto the cookie sheet, and spread out all the little cubes. 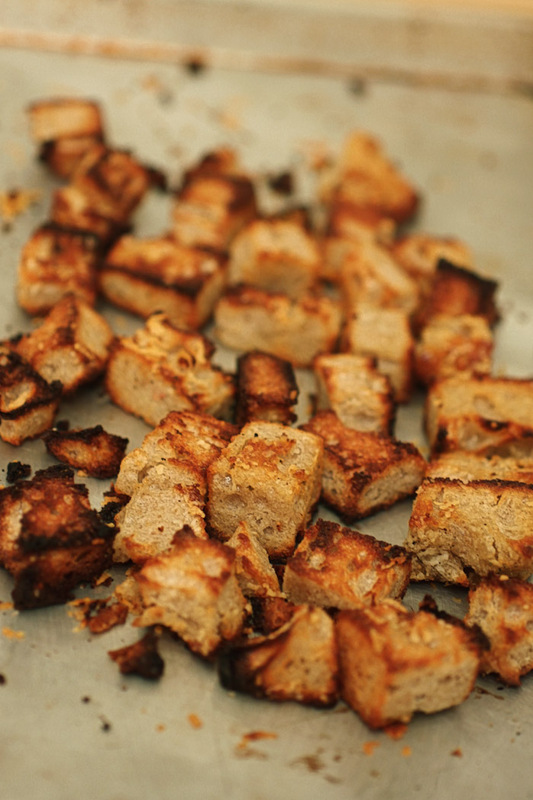 Toast for a few minutes on one side, then rotate the cubes (OVEN MITTS!!!) so that they brown evenly on all sides. Eat them immediately in a salad, soup, or like popcorn! And, yes, I’m still talking about bread. 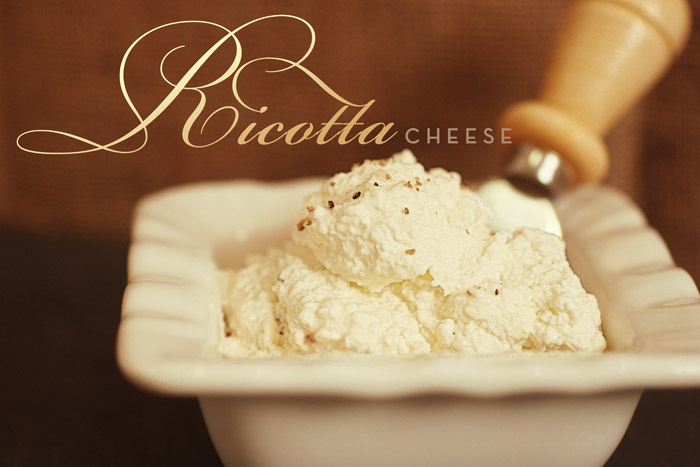 Does anyone have a count of how many times I have mentioned how much I love ricotta cheese? I think the obsession started when I visited Anfora Wine Bar for the first time and spread some of their signature perfectly whipped, salty-sweet version on a piece of airy toast. It was a testament to the benefits of homemade: so much more flavor! And so much room for innovation. So I decided to make my own. Because my cholesterol was getting dangerously low, and I needed to have a steady stream of cheese-related fats in order to counteract that. I looked around and found a bunch of very helpful instructions on making ricotta cheese. I was assured it would be easy. The first time I tried it, I failed miserably. I looked away for a second and the whole mixture on the stove top boiled over and made quite a mess. Which I should be used to by now. Take away lesson: Don’t boil your ricotta milk. Anyway, I had MUCH success the second, third and fourth times. I have created a few different variations with instructions below. 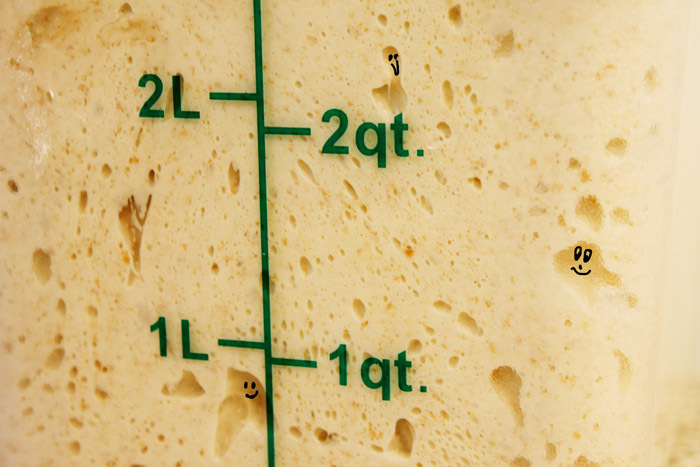 There is also a helpful video that shows the EXACT MOMENT of cheese formation. Are you all a-tingle? I bet you are. Cut enough cheesecloth to cover the bottom of your colander. 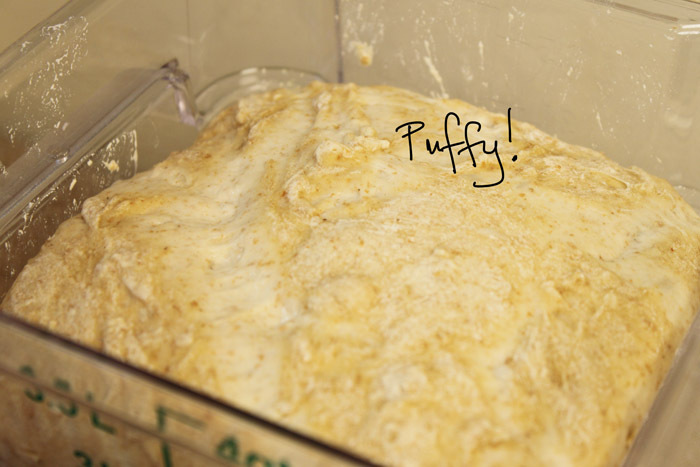 4-ply the cheesecloth to make sure no actual cheese escapes – just water! Pour 2 cups of the whole milk, all of the buttermilk and all of the white vinegar into a small pot outfitted with a thermometer. Heat this over medium-low heat and babysit it. The babysitting involves you watching like a hawk and stirring occasionally so it doesn’t boil over. The thermometer will start to creep toward 160 degrees. This is the action zone. Your milk/buttermilk will start to separate and curdle. This is one of those rare occasions when curdling is a good thing. Stop stirring and let the milk completely separate and curdle. Remove from the heat. Using a slotted spoon, scoop out the curdled portion (this is your ricotta!) and place it on the cheesecloth that is sitting in the colander. Let it drain for about 10 minutes. After draining, I transfer it to a container (like a tupperware container, as you can keep your chemistry experiment in the fridge for up to a week). With a fork or a whisk, add in your 2 Tbsp of milk, the olive oil and the truffle salt. Give it a good whipping. I add this last extra step as ricotta can get a little dry from the draining. Especially if you leave it in the colander and forget about and say…oh start vacuuming your apartment or something. This makes it moist and flavorful. Note: For this version I didn’t use any buttermilk. Works just fine! Pour 2 cups of the whole milk and lemon juice into a small pot outfitted with a thermometer. Heat this over medium-low heat and babysit it. The babysitting involves you watching like a hawk and stirring occasionally so it doesn’t boil over. The thermometer will start to creep toward 160 degrees. This is the action zone. Your milk will start to separate and curdle. Stop stirring and let the milk completely separate and curdle. Remove from the heat. Using a slotted spoon, scoop out the curdled portion and place it on the cheesecloth that is sitting in the colander. Let it drain for about 10 minutes. After draining, I transfer it to a container. With a fork or a whisk, add in your 2 Tbsp of milk, honey and sea salt. Give it a good whipping. Hello again. Your weekly Valentine’s Day reminder, here. Today we are going to focus on a homemade treat: breakfast. This Valentine’s Day, instead of dashing out the door, hair half-brushed, pants mostly on, with half a Pop Tart clamped between your incisors, sit down at the table. On chairs. And eat. With utensils. Once your butter is suitably soft (you should be able to easily mix it with a spoon), place it in a bowl and using a regular spoon, drizzle the 2 Tbsp. honey over it. Mix the honey and butter together so it’s all incorporated. Sprinkle a little sea salt over the top. I really like the punch of a sweet-salty flavor mix (like salted caramels). But if you don’t, you can skip that part. Cut thick slices from your Brioche bread loaf (like maybe about 1.5″ thick) and toast them up to your desired level of toastiness. I like a nice golden brown, but you’re not making this for me, are you? Are you?? Once your toasts are toasted, place them on some nice plates (yes, you do need to use plates) and spread some honey butter on top. Serve with extra honey butter on the side. 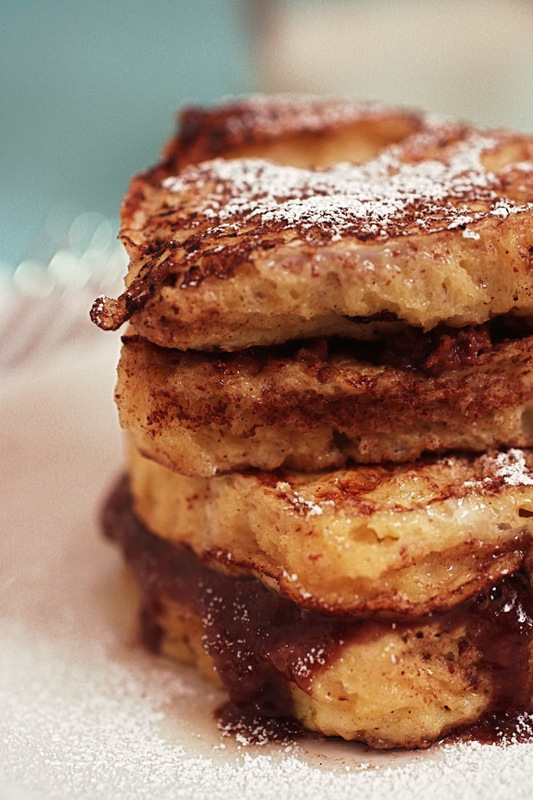 If you are more advanced, or feeling adventurous, you can move on to: French Toast Sandwiches with Nutella Mascarpone Filling. Oh yeah. First make the filling. In a small mixing bowl, combine the mascarpone cheese and the Nutella. Mix until well integrated. Give it a taste and see if you would like to add either more Nutella or more cheese. Crack the two eggs into a wide bottomed bowl. Add the 1/2 cup of milk and a dash or two of cinnamon and the vanilla extract. Using a fork, mix everything up so that you now have a light yellow mixture with swirls of cinnamon. Using the heart-shaped cookie cutter, cut out hearts from your bread slices. Heat up a frying pan on medium-low heat and melt the tablespoon of butter in the pan. Dredge both sides of the heart shaped bread slices in the egg and milk mixture, and then add them to the heated frying pan, cooking about a minute on each side. 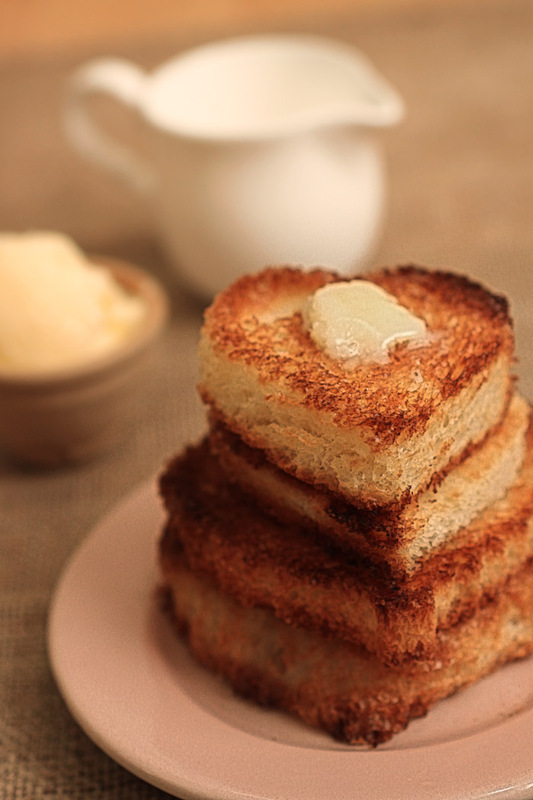 Place the cooked French Toast slices on plates (here we go again with the plates). 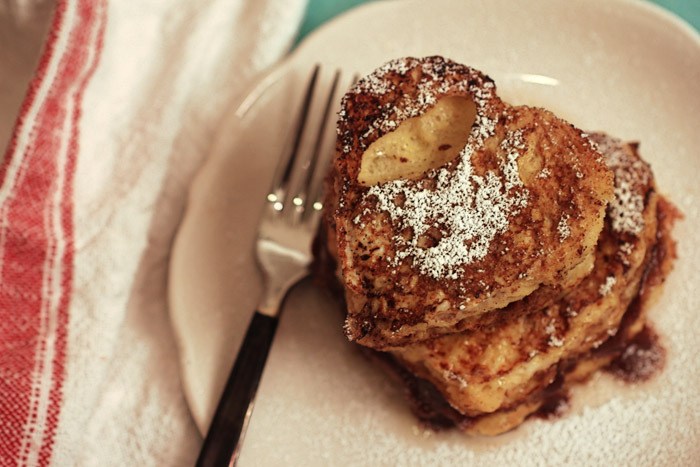 Using a knife, spread the Nutella and mascarpone filling on top of one of the French Toast Hearts. 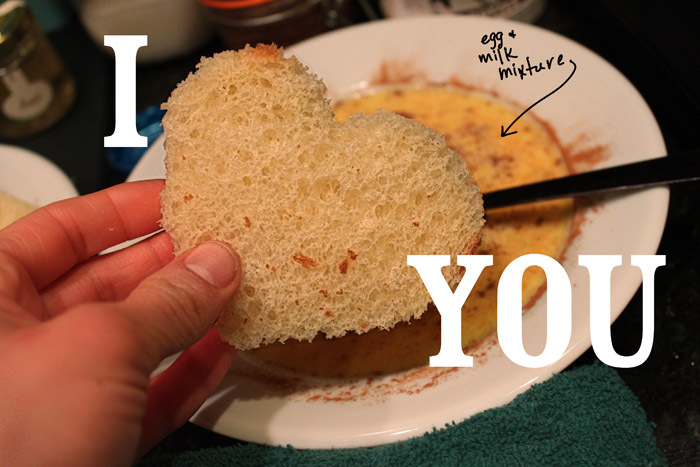 Top with another French Toast Heart to make a sandwich. Repeat with the other two slices. 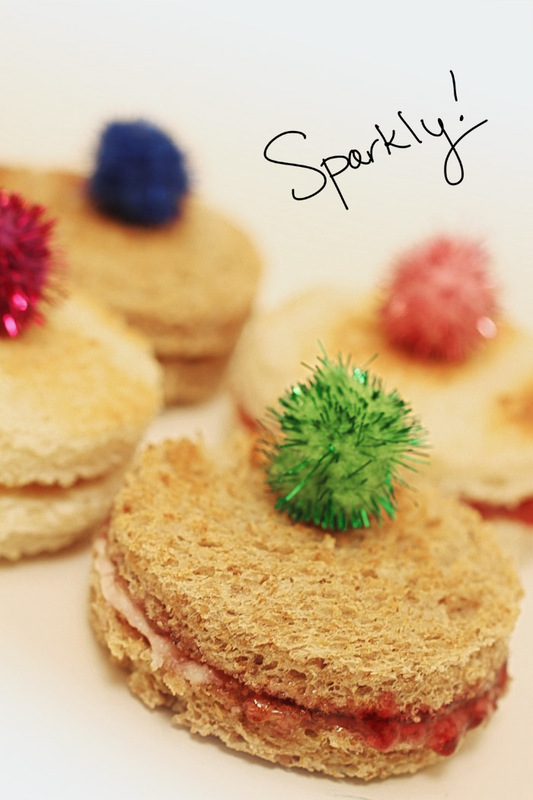 Serve with a dusting of powdered sugar and watch the sparks fly! My Aunt Emily sends me a birthday card every year. But it’s my responsibility to IMMEDIATELY call her upon receipt of this card. Or else. I’m done. Seriously. On my last birthday, I received my card as usual. So I called. “Thank you for the card, Aunt Emily,” I shouted (you may recall that she can’t hear very well), “How are you?” Demerits are also given for not immediately asking how she is doing. “Oh I don’t want to talk about that. I want to hear about someone special.” Translation: She wants to know about my love life. “There’s no one special right now, Aunt Emily,” I responded, still loudly, and through gritted teeth. “Well you’re just getting fussy,” she decides. 1. The last time she asked me this question, I happened to be dating someone. When I told her this, she took me aside and whispered in my ear, “Play the field.” Huh. 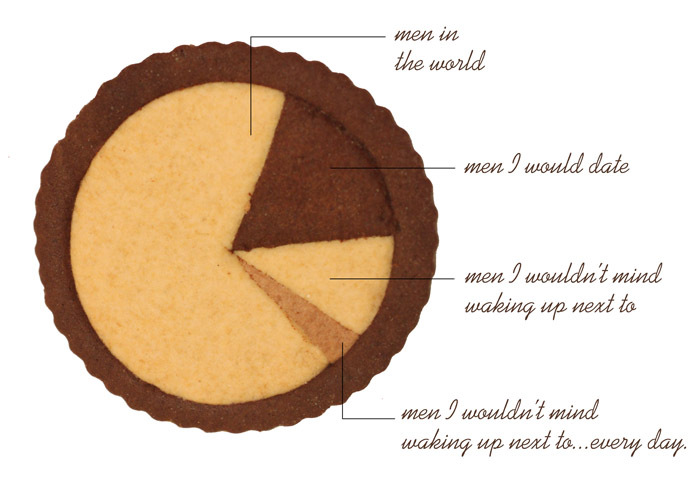 I will demonstrate with the use of pie charts (this is a food blog, after all). As demonstrated above, I have a perfect right to be fussy. There aren’t many guys that fit into that narrowest pie piece. And I feel the same way about food. Do you have a favorite food? Just one? Would you eat it, if you could, every day? Why would I eat sub-par pasta? What’s the point? I’m not looking to fill a void (although my stomach is frequently empty). I want those calories to count! 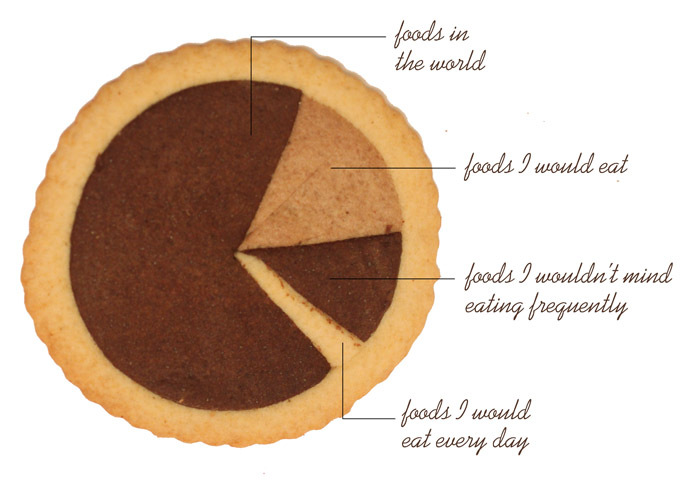 As the above chart suggests, I do have a few foods that I would eat every day. I actually do eat oatmeal for breakfast every morning. Add that to the list of things you really didn’t need to know. Usually, my cabinet is stacked with this brand, but recently I decided to give baked oatmeal a try. What resulted was the equivalent of a giant, chewy oatmeal cookie that filled my apartment with the aroma of cinnamon and warm blueberries. Here’s the recipe, which was inspired by this one at Fresh and Foodie. 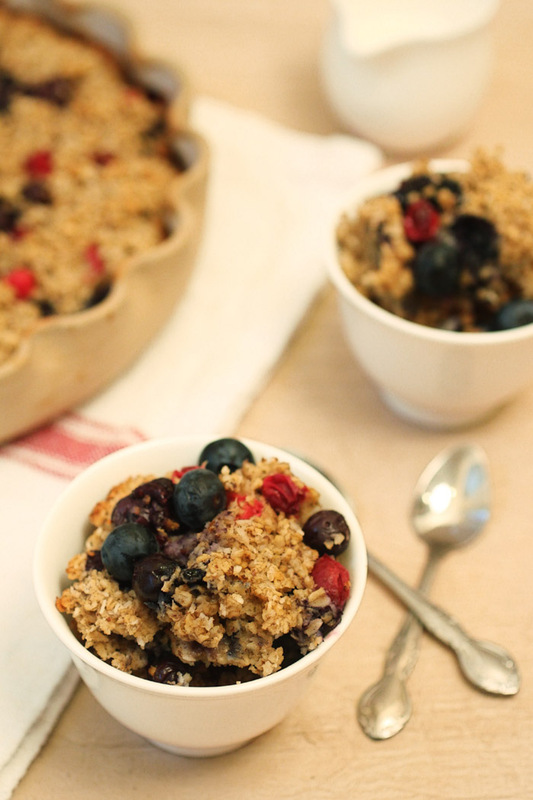 As many blueberries and cranberries as you want to throw in there. Or none – your call. Lightly grease an 8″x8″ baking dish (I actually used a round one). Mix eggs and sugar in the bottom of the dish, whisking to remove lumps. Add melted butter and carefully whisk to combine. Add baking powder, vanilla, ground flax seed, cinnamon, nutmeg and salt directly to the dish and whisk well. Add the milk and stir to combine. Stir in the toasted coconut and oats, folding into the mixture, making sure everything is combined well. Cover the dish with plastic wrap and refrigerate over night. Remove from oven and let cool for a few minutes. Then cut yourself a piece, top it with milk and whatever else you want. Make sure you get some of the crispy edges in your slice. 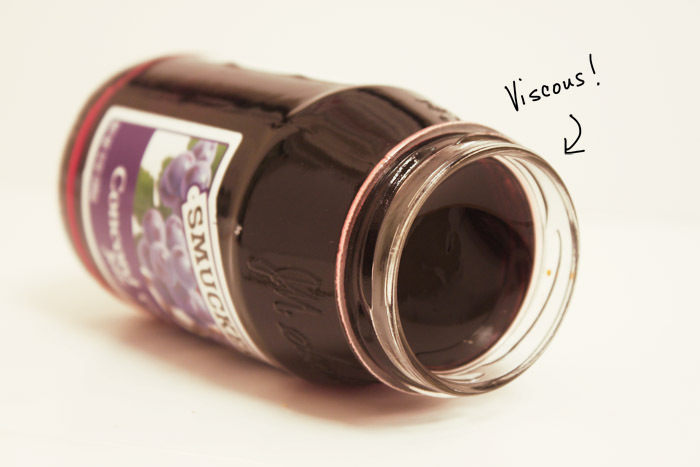 Dressing: Balsamic vinegar mixed with extra virgin olive oil and a touch of sea salt. Heat up your oven to 400 degrees. Peel your sweet potato, then either cut into wedges or use a mandolin to make waffle fries! Place your cut, raw potatoes in a bowl, drizzle with olive oil and sprinkle with salt. Space evenly on a cookie sheet and pop them in the oven. After about 15 minutes (for wedges – less time for thinner cuts), flip them over so the other side can get nice and brown). Use a spatula, please. I don’t want any martyrs or burn victims. Roast for another 10 minutes or so, keeping a sharp eye the whole time. Take them out, let them cool slightly. Prepare your salad by starting with a layer of sun dried tomatoes on the bottom of the plate. 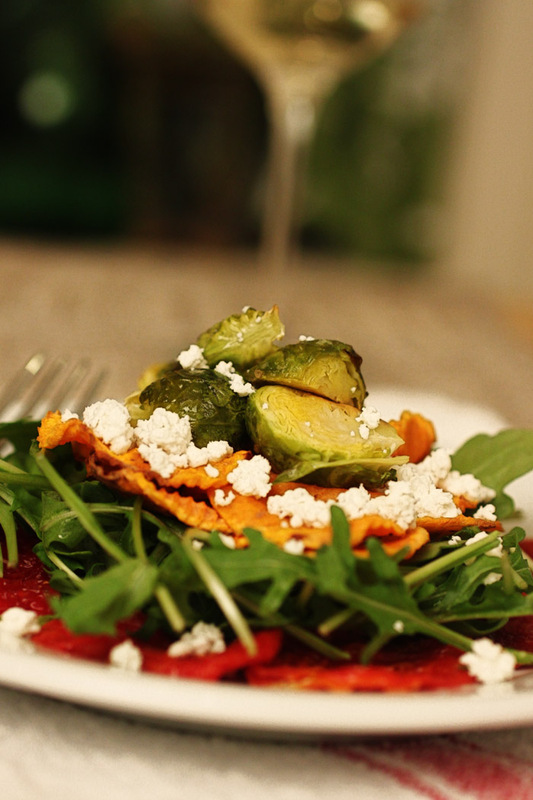 Then pile on some arugula, a layer of your sweet potato “fries,” and brussels sprouts. You should now have a nice tower of vegetables. Top with crumbled goat cheese and if there is some white wine wandering around your place, pour yourself a glass of that too. OK, not for lunch. Well, maybe. When I was in Rome this past October with Marmo, I had my favorite meal at Roma Sparita: their Spaghetti Cacio e Pepe which was served in a bowl of fried cheese. Fried cheese bowl! What’s not to love? You can see the original here. I decided I needed to make this for myself. It’s such a simple dish and a very traditional Roman one too. 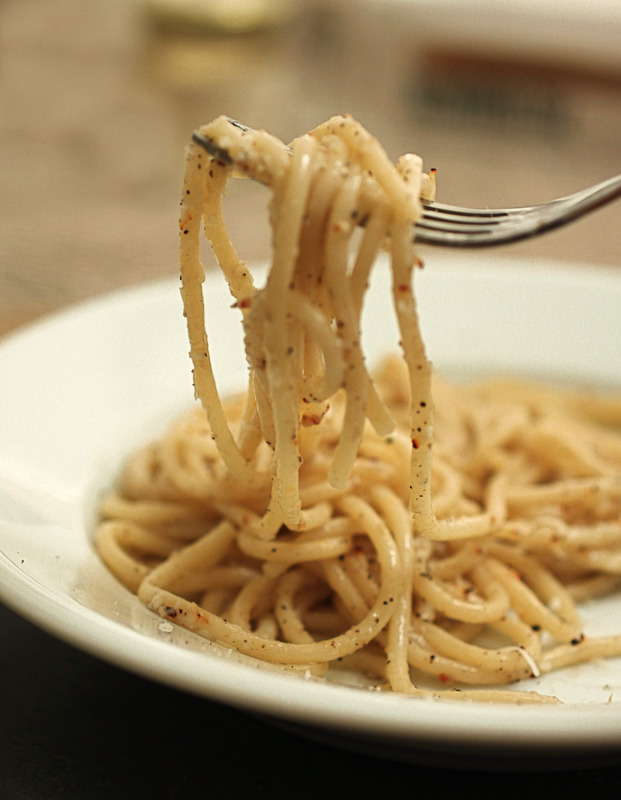 The main ingredients are just Peccorino Romano cheese, salt and lots of freshly ground black pepper. However, it feels luxurious. A little swirl of reserved pasta water added to the cooked spaghetti gives the dish a creamy texture. Swirling this pasta around my fork, I pretend I’m sitting at Roma Sparita’s blue-checked outdoor tables with the sunshine gleaming through my decanter of wine. I purchased the cheese at Murray’s Cheese Shop on Bleecker where the helpful cheesemongers picked out a nice sharp variety with a dark rind. The cheesemonger BEGGED me to eat the rind (please, PLEASE eat the rind, he said). So I did. When I grated it on my pasta, I made sure to grate the rind as well. It added pretty flecks of brown and gray to the the dish, as well as a bit of texture. Cook spaghetti in well-salted boiling water in a large, wide-bottomed pot. Drain spaghetti, reserving 1 1/2 cups of pasta cooking water. Dry out your pot, then heat the olive oil over high heat. Add drained spaghetti and 3/4 cup of reserved pasta water and watch out as the pot is very hot and will make the water splatter around a bit. Add butter, cheese, ground pepper and cayenne and toss together with tongs. Taste, adding more pasta water, cheese, pepper or salt to taste. 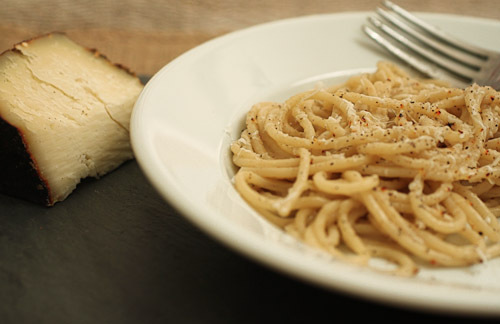 Be careful adding salt as Peccorino is a salty cheese. Serve immediately, sprinkling with reserved cheese and an extra grind or two of black pepper. Got a food you would eat every day? Tell us about it in the comments section. The fussier, the better.